On a cold December Detroit morning in 2006 the Magic Bus was born. She knew from the start that she wasn’t like other buses. She was a star: colorful, bright, and spectacular. Alas, she was trapped in the body of an average green shuttle bus. 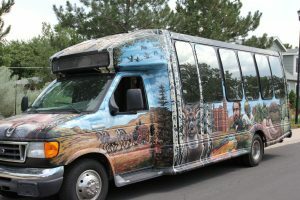 Languishing in a crowded Detroit parking lot, she heard stories of a land out west where buses played in the mountains carrying happy passengers and frolicking with woodland creatures. So overwhelming was the call for freedom and adventure that one night, while the guard was on his rounds, she charged full throttle for the gate, busted through it, and sped westward, never looking back. With ease she landed a gig at Beaver Creek in Colorado, transporting happy vacationers around the bustling mountain resort. While she was content in her new mountain home, something was still missing. Even though she looked like the other buses on the mountain, she knew she was different. She couldn’t stop thinking that she was destined for something greater, and on crisp cool mornings, still and quiet, she would listen to the wind, listening for a whisper of destiny, an invitation to show her true colors. Word on the mountain was that fresh opportunity could be found in the big city, and one night she slipped away, Denver bound, hopeful, leaving only a wake of red taillights behind. I knew from the start that finding the perfect bus for our tour company would be a tough task. I needed her to be powerful and tough, yet elegant and smooth. She needed huge windows, extreme comfort, total climate control, and an appetite for adventure. Above all, she had to shine like a diamond with an inner glow so colorful and bright it could not be denied. After months of fruitless searching I began to give up hope and started to consider just opening a taco stand in Old Town instead. In a last ditch effort, I headed down to Denver and through a part of town where out of work buses are known to congregate. That’s when I saw her. She was radiant. As she stood confidently against a mountainous backdrop, effortlessly overwhelming the lot with her inner glow, I knew she was the one! Our eyes met. I got goosebumps. She blushed. Hours later we were on the road, Fort Collins bound, wind at our backs, heading for destiny and a chance to show our true colors. The rest is history. With the help of local artist Terry McNerney, the Magic Bus underwent a complete makeover and she’s been seen flaunting her stuff all around town like the superstar diva she is! She loves posing for photos and insisted we display one of her photo shoots on the website for your enjoyment. The Magic Bus and our team work hard to produce a colorful tour experiences you are sure to enjoy. Climb aboard!